Castres hosted south-west neighbours Toulouse on Friday night in what turned out to be atrocious conditions which actually saw the players leaving the field at one stage, as a hail storm and lightning threatened to put an end to the evening. Toulouse came out easy winners 28-10 thanks to two tries by centre Maleli Kunavore, and one from Cedric Heymans. Flyhalf David Skrela kicked two conversions, two penalties, and a drop goal. The hail stones that came pelting down on the players were bad enough that the referee decided to take them from the field for a short while. The threat of lighting though, was perhaps more of the concern than the hail. With the Heineken Cup on the way shortly, this was an excellent confidence boost for the finalists of last season, as they host Bath in their opening Pool 5 fixture next weekend. This short vid is pretty nicely done, and gives you an idea of what it was like out there during the match. hah, nice tune. bet the metal heads loved that video. whats with the floating white ball around 1:45? What I said a year ago about the related post. 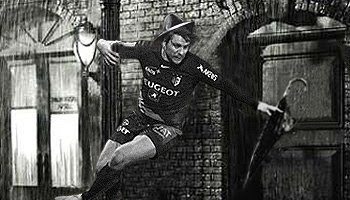 When I saw "Singing in the Rain" and two French teams, I thought it be more plausible that the video would be this scene from "A Clockwork Orange"
And not one of actual weather issues. Opponents being kicked whilst on the deck. Vulnerable players being poked in various orifices and sockets. "whats with the floating white ball around 1:45"
I think its called a balloon, they are quite common and popular, especially with children. You commonly get them at fairgrounds and the circus and even at the dentist (if you are lucky. )When filled with helium (which is gas hich is less dense than air) they will float upwards and are often seen attacted with string to childrens wrists. p.s. anyone who says they are being soft has clearly never felt what serious hail is like! very sore and potentially dangerous too. I played in the hail once,and let me tell you that @#%$ hurts! I would never do it again I tell you that much.